Sea turtle (or seaturtle) is the common name for any of the large marine turtles comprising the superfamily Chelonioidea, characterized by forelimbs in the form of large flippers or paddles. There are two extant families, Cheloniidae and Dermochelyidae. Members of the family Cheloniidae are characterized by a lightweight, low shell covered with scutes, while the sole extant species in Dermochelyidae, the leatherback sea turtle (Dermochelys coriacea), is characterized by a teardrop shaped carapace lacking epidermal scutes and covered with a leathery skin. Members of both families have a large head that cannot be retracted into the shells. There are seven living species, arranged into six genera. Three extinct genera also are recognized. Sea turtles are found worldwide in all the world's oceans except perhaps the Arctic Ocean. Sea turtles provide important functions for the ecosystem. They are a significant part of food chains, both in the ocean and on land where they lay many eggs, with both the eggs and the hatchlings particularly susceptible to predation. Sea turtles also recycle nutrients to the beach and dune ecosystems, which helps to support vegetation and prevent erosion. And, while generally carnivorous, those that graze sea grass help to keep this vegetation healthy. Sea turtles have historically provided an important function for people as food and with the shells used for decorative purposes. However, today the main function is one of adding to the wonder of nature and ecotourism trips. Various anthropogenic factors have lead to serious declines in sea turtle populations such that all are considered threatened, with three species classified as critically endangered and two as endangered. As a result, various protective mechanisms have been put in place for conservation of these great reptiles, but poaching, accidental death during fishing, and habitat destruction, among other factors, continue to threaten their populations. 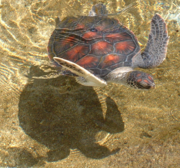 Sea turtles, along with other turtles and tortoises, are part of the Order Testudines. Although sea turtles have been around for tens of millions of years since the Mesozoic, the body plan of sea turtles has remained relatively constant. Sea turtles possess dorsoventrally-flattened bodies with two hind legs and highly-evolved paddle-like front arms (Lutz and Musick 1996). Extant sea turtles are placed into two families within the superfamily Chelonioidea. Cheloniidae includes six species in five genera: flatback (Natator depressus), green sea turtle (Chelonia mydas), hawksbill ( Eretmochelys imbricata), Kemp's ridley ((Lepidochelys kempii)), olive ridley (Lepidochelys olivacea), and loggerhead (Caretta caretta). The East Pacific subpopulation of the green turtle was previously classified as a separate species, the black turtle, but DNA evidence indicates that it is not sufficiently distinct from the green turtle (Karl and Bowen 1999). These species are all characterized by a streamlined shell that is low and covered with scutes (external plates derived from the epidermis), paddle-like forelimbs, a large head that cannot be retracted into the shell, and a skull with a solid, bony roof (Iverson 2004a). Different species are distinguished by varying anatomical aspects: for instance, the prefrontal scales on the head, the number of and shape of scutes on the carapace, and the type of inframarginal scutes on the plastron. Species generally range from two to four feet in length (0.5 to 1 meters) and proportionally narrower (WWF 2009). The olive ridley is the smallest sea turtle, with an average weight just over 100 lb (up to 50 kilograms) and a carapace length reaching only 30 inches (70 centimeters). Dermochelyidae includes one extant species, the leatherback sea turtle (Dermochelys coriacea). The leatherback is the only sea turtle that does not have a hard shell, instead carrying a mosaic of hundreds of bony plates just beneath its leathery skin. It also is characterized by a smooth, streamlined carapace that is teardrop shaped, seven longitudinal ridges, no epidermal scutes, no scales on the head, and a prominent tooth-like cusp on both sides of the upper jaw (Iverson 2004b). The paddle-like forearms lack claws (Iverson 2004b). The leatherback is the largest of the sea turtles, measuring six or seven feet (2 meters) in length at maturity, and three to five feet (1 to 1.5 m) in width, weighing up to 1300 pounds (650 kg). Green turtle breaks the surface to breathe. Sea turtles spend almost all their lives submerged but must breathe air for the oxygen needed to meet the demands of vigorous activity. With a single explosive exhalation and rapid inhalation, sea turtles can quickly replace the air in their lungs. The lungs are adapted to permit a rapid exchange of oxygen and to prevent gasses from being trapped during deep dives. The blood of sea turtles can deliver oxygen efficiently to body tissues even at the pressures encountered during diving. During routine activity, green and loggerhead turtles dive for about 4 to 5 minutes and surface to breathe for 1 to 3 seconds. Sea turtles possess a salt excretory gland at the corner of the eye, in the nostrils, or in the tongue, depending upon the species; chelonian salt glands are oriented in the corner of the eyes in leatherback turtles. Due to the iso-osmotic makeup of jellyfish and other gelatinous prey upon which sea turtles subsist, sea turtle diets are high in salt concentrations and chelonian salt gland excretions are almost entirely composed of sodium chloride at approximately 1500-1800 mosmoll-1 (Marshall and Cooper 1988; Nicolson and Lutz 1989; Reina and Cooper 2000). 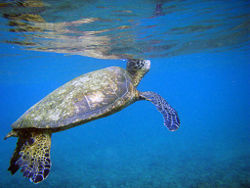 Turtles can rest or sleep underwater for several hours at a time but submergence time is much shorter while diving for food or to escape predators. Breath-holding ability is affected by activity and stress, which is why turtles drown in shrimp trawls and other fishing gear within a relatively short time (MarineBio). Seven distinct extant species of sea turtles are recognized; they constitute a single radiation that was distinct from all other turtles at least 110 million years ago. 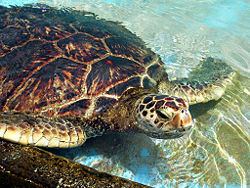 During that radiation, sea turtles split into two main subgroups, which still exist today: The unique family Dermochelyidae, which consists of a single species, the leatherback; and the six species of hard-shelled sea turtle, in the family Cheloniidae. The superfamily Chelonioidea has a worldwide distribution excluding near the poles. Most sea turtles are found in tropical and semi-tropical regions, but also are found in temperate regions. The leatherback sea turtle, which has a worldwide distribution, is the only turtle, or reptile, to regularly travel to and survive Arctic or sub-Arctic habitats; it has been sighted regularly off Newfoundland, Canada and observed off the shores of Greenland as far north as 69°N (Sadove 2001). It also is one of two turtles to regularly nest in the Mediterranean, along with the green turtle, although the hawksbill and Kemp's ridley turtle occur there occasionally (Camiñas 2004). The leatherback, which may have the greatest distribution of any reptile, also is found in cold temperate waters around Newfoundland, Iceland, Alaska, Norway, New Zealand, and Cape of Good Hope (Iverson 2004b). The Flatback turtle is found solely on the northern coast of Australia. Members of the Cheloniidae family tend to enter temperate seas during the summer, but migrate to warmer waters for the winter, or bury themselves in the mud in shallow coastal areas during the winter (Iverson 2004a). The leatherback sea turtles can feed in both cold and warm environments because they can maintain their body temperature above the water temperature. They generate body heat by muscle activity and it is lost very slowly, their oily skin has excellent insulative properties, and they have a countercurrent circulatory system that helps in heat retention (Iverson 2004b). Leatherback turtles can dive to depths of more than 3,300 feet (1,000 meters) to reach food sources (Iverson 2004b). Although sea turtles spend most of their lives in the oceans, they come ashore to nest and lay their eggs. They often make extremely long migrations between their feeding grounds and their nesting grounds. Some migrate up to 190 miles (300 kilimeters) and leatherback sea turtles have been recaptured more then 3,100 miles (5,000 kilometers) from where released, with individuals traveling more than 19 miles (30 kilometers) per day for several weeks (Iverson 2004a, 2004b). The ridley turtles are especially peculiar because instead of nesting individually like the other species, they come ashore in one mass arrival known as an "arribada" (arrival). With the Kemp's ridley, this occurs during the day. Their numbers used to range in the thousands but due to the effects of extensive egg poaching and hunting in previous years the numbers are now in the hundreds. Most nesting is done at night (Iverson 2004a). Sea turtles are highly sensitive to the Earth's magnetic field and apparently use it to navigate. The longevity of sea turtles has been speculated at 80 years. The fact that most species return to nest at the locations where they were born seems to indicate an imprint of that location's magnetic features. After about 30 years of maturing, adult female sea turtles return to the land to nest, usually on the same beach from which they hatched. This can take place every two to four years in maturity. Sea turtles make from four to seven nests per nesting season. All sea turtles generally employ the same methods when making a nest. A mature nesting female hauls herself onto the beach until she finds suitable sand on which to create a nest. Using her hind flippers, the female proceeds to dig a circular hole 40 to 50 centimeters deep. After the hole is dug, the female then starts filling the nest with a clutch of soft-shelled eggs, one by one, until she has deposited around 150 to 200 eggs, depending on the turtle's species. The nest is then re-filled with loose sand by the female, re-sculpting and smoothing the sand over the nest until it is relatively undetectable visually. The whole process takes around thirty minutes to a little over an hour. After the nest is laid, the female then returns to the ocean (Audubon 1897). Some of the eggs are unfertilized and the rest contain young turtles. Incubation takes about two months. The length of incubation and the gender of the hatchling depends on the temperature of the sand. Darker sands maintain higher temperatures, decreasing incubation time and increasing the frequency of female hatchlings. When the time comes, these hatchlings tear their way out of their shells with their snout and once they have reached the surface of the sand, they will instinctively head towards the sea. Only a very small proportion of them (usually .01 percent) will be successful, as many predators wait to eat the steady stream of new hatched turtles (since many sea turtles lay eggs en masse, the eggs also hatch en masse). The hatchlings then proceed into the open ocean, borne on oceanic currents that they often have no control over. While in the open ocean, it used to be the case that what happened to sea turtle young during this stage in their lives was unknown. However in 1987, it was discovered that the young of Chelonia mydas and Caretta caretta spent a great deal of their pelagic lives in floating sargassum beds—thick mats of unanchored seaweed floating in the middle of the ocean. Within these beds, they found ample shelter and food. In the absence of sargassum beds, turtle young feed in the vicinity of upwelling "fronts" (Carr 1987). Reports in 2007 verified that green turtle (Chelonia mydas) hatchlings spend the first three to five years of their lives in pelagic waters (Reich et al. 2007; Brynner 2007). Out in the open ocean, pre-juveniles of this particular species were found to feed on zooplankton and smaller nekton before they are recruited into inshore seagrass meadows as obligate herbivores. With the exception of the largely herbivorous green sea turtle, which feeds mainly on sea grasses, sea turtles are primarily carnivorous. Prey include mollusks, crustaceans, sponges, sea urchins, barnacles, and fish. Leatherbacks prefer oceanic jellyfish, but also consume snails, bivalve mollusks, octupuses, squids, crabs, hydrozoans, tunicates, and small fish, and supplement their diet with algae, kelp, and sea grasses (Iverson 2004a, 2004b). Most researchers' theories portray that sea turtles have an acute sense of smell in the water. Their experiments showed that the hatchlings reacted to the scent of shrimp. This sense allows sea turtles to locate food in deep and murky water. Sea turtles open their mouths a bit and draw in water through the nose, then immediately empty it out again through the mouth. Pulsating movements of the throat are thought to be associated with smelling. Like many other animals in the world, sea turtles have predators. While adult sea turtles have few predators, mainly sharks, the eggs and hatchlings face many predators, including fish, seabirds, raccoons, and lizards. One natural protection is their shell. Other protections include the ability of some species' massive jaws to suddenly snap shut, and to stay underwater for hours on end; these are both instinctual and natural. Turtles have many senses to aid them in the sea. Sea turtle ears have a single bone in the middle ear that conducts vibrations to the inner ear. Researchers have found that sea turtles respond to low frequency sounds and vibrations. Sea turtles have an extremely good eyesight in water but are shortsighted on land. Under experimental conditions, the loggerhead and green sea turtle hatchlings showed a preference for ultraviolet, blue-green and violet light. Sea turtles are touch-sensitive on the soft parts of their flippers and on their shell. Sea turtles on a beach in Hawaii. In addition to their key role in food chains, sea turtles play key roles in two ecosystems that are critical to them as well as to humans: The oceans and beaches/dunes. If sea turtles were to become extinct, the negative impact on beaches and the oceans would potentially be significant. In the oceans, for example, sea turtles, especially green sea turtles, are one of the very few creatures (manatees are another) that eat a type of vegetation called sea grass that grows on the sea floor. Sea grass must be kept short to remain healthy, and beds of healthy sea grass are essential breeding and development areas for many species of fish and other marine life. A decline or loss of sea grass beds would mean a loss of the marine species that directly depend on the beds, which would trigger a chain reaction and negatively impact marine and human life. When one part of an ecosystem is destroyed, the other parts will follow. Beaches and dunes are a fragile ecosystem that does not get many nutrients to support its vegetation, which is needed to help prevent erosion. Sea turtles contribute nutrients to dune vegetation from their eggs. Every year, sea turtles lay countless numbers of eggs in beaches during nesting season. Along one twenty-mile (32 kilometer) stretch of beach in Florida alone, for example, more than 150,000 pounds of eggs are laid each year. Nutrients from hatched eggs as well as from eggs that never hatch and from hatchlings that fail to make it into the ocean are all sources of nutrients for dune vegetation. A decline in the number of sea turtles means fewer eggs laid, less nutrients for the sand dunes and its vegetation, and a higher risk for beach erosion. Moche Sea Turtle. 200 C.E. Larco Museum Collection Lima, Peru. Marine turtles are caught worldwide, despite it being illegal to hunt most of the species in many countries (CITES 2008; UNEP-WCMC 2009). A great deal of intentional marine turtle harvests worldwide are for the food industry. In many parts of the world, the flesh of sea turtles are considered fine dining. Texts dating back to the fifth century B.C.E. describes sea turtles as exotic delicacies in ancient China (Schafer 1962). Historically, many coastal communities around the world have depended on sea turtles as a source of protein. Several turtles could be harvested at once and kept alive on their backs for months until needed, including on the deck of ships. The skin of the flippers are also prized for use as shoes and assorted leather-goods. To a much lesser extent, specific species of marine turtles are targeted not for their flesh, but for their shells. Tortoiseshell, a traditional decorative ornamental material used in Japan and China, is derived from the carapace scutes of the hawksbill turtle (Heppel and Crowder 1996; Strieker 2001). The use of marine turtle shells for decorative purposes is by no means limited to the orient. Since ancient times, the shells of sea turtles (primarily the hawksbill) have been used by the ancient Greeks and ancient Romans. 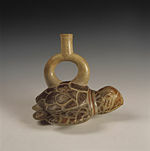 Various articles and ornaments used by the elite of these societies, such as combs and brushes, were from processed turtle scutes (Casson 1982). The Moche people of ancient Peru worshiped the sea and its animals. They often depicted sea turtles in their art (Berrin and Larco 1997). All species of sea turtles are listed as threatened species according to the IUCN Red List. The leatherback, Kemp's ridley, and hawksbill turtles are listed as critically endangered. The olive ridley and green turtles are considered endangered, and the loggerhead is a threatened species (FWS 2007). The flatback's conservation status is unclear due to a lack of research data. There are a number of anthropogenic factors that have contributed to the decline in sea turtle populations, including hunting, gathering eggs, fishing bycatch and accidental deaths, and habitat destruction. Sea turtles used to be hunted on a large scale in the whaling days for their meat, fat, and shells. Coastal peoples have also been known to gather turtle eggs for consumption (Settle 1995). One of their most significant threats now comes from bycatch and accidental deaths due to various fishing methods. 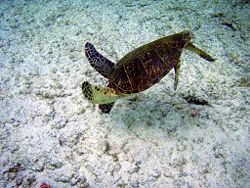 Long-line fishing is cited as one of the causes of sea turtle deaths (Smith 2007). Likewise, nets used in shrimp trawling and fishing have been known to cause the accidental deaths of sea turtles. The turtles, as air-breathing reptiles, must surface to breathe. Caught in a fisherman's net, they are unable to go to the surface to breathe and suffocate to death in the net. 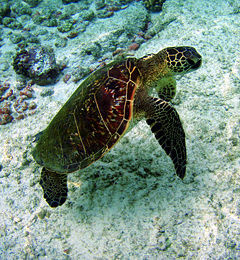 Some relatively inexpensive changes to fishing techniques, such as slightly larger hooks and traps from which sea turtles can escape, can dramatically cut the mortality rate (Kinan 2006). Turtle Excluder Devices (TEDS) have reduced sea turtle bycatch in shrimp nets by 97 percent. Another danger comes from marine debris, especially from abandoned fishing nets in which they can become entangled. Beach development is another area which poses threats to sea turtles. 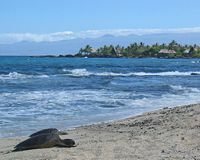 Since sea turtles return to the same beach locations to nest, if these areas are developed they may be left with nowhere to nest, or their nesting locations may be threatened by human activity. Therefore, there has been a movement to protect these areas, in some cases by special police. In some areas, such as the east coast of Florida, after the adult turtles lay their eggs, they are dug up and relocated to special fenced nurseries where they can be protected from beach traffic. (This is not the best thing to do, as many turtle species return to the beach on which they were born.) Hatchlings find their way to the ocean by crawling towards the brightest horizon, but often become disoriented on developed stretches of coastline. Special lighting ordinances may also be enforced to prevent lights from shining on the beach and confusing young hatchlings, causing them to crawl towards the light and away from the water, usually crossing a road. A turtle-safe lighting system uses red light in place of white light as sea turtles cannot see red light. Another major threat to sea turtles is the black market trade in eggs and meat. This is a pervasive problem throughout the world, but especially a concern in the Philippines, India, Indonesia, and throughout the coastal nations of Latin America. Estimates are as high as 35,000 turtles killed a year in Mexico and the same number in Nicaragua. Conservationists in Mexico and the United States have launched "Don't Eat Sea Turtle" campaigns in order to reduce the urban black market trade in sea turtle products. Sea turtles are often consumed during the Catholic holiday, Lent, even though they are reptiles, not fish. Conservation organizations have written letters to the Pope asking that he declare turtles meat. Sea turtles can also be affected by Fibropapillomatosis, a disease that has been found among sea turtle populations and causes tumors. Audubon, M. R. 1897/1986. Audubon and His Journals. New York: Dover Publications. ISBN 9780486251448. Brynner, J. 2007. Sea turtles' mystery hideout revealed. LiveScienceSeptember 19, 2007. Retrieved January 19, 2009. Camiñas, J. A. 2004. Sea turtles of the Mediterranean Sea: Population dynamics, sources of mortality and relative importance of fisheries impacts. FAO Fisheries Report No. 738 Supplemental. Retrieved January 21, 2009. Carr, A. 1987. New perspectives on the pelagic stage of sea turtle development. Conservation Biology 1(2): 103–121. Retrieved January 19, 2009. Casson, L. 1982. Periplus Maris Erythraei: Notes on the text. The Journal of Hellenic Studies 102: 204–206. Retrieved January 21, 2009. Convention on International Trade in Endangered Species of Wild Flora and Fauna (CITES). 2008. Appendices I, II and III. CITES. Retrieved January 21, 2009. Davidson, O. G. 2001. Fire in the Turtle House: The Green Sea Turtle and the Fate of the Ocean. United States: United States of Public Affairs. ISBN 1586481991. Fish and Wildlife Service (FWS). 2007. Loggerhead sea turtle (Caretta caretta). United States Fish and Wildlife Service. Retrieved January 21, 2009. Heppel, S. S., and L. B. Crowder. 1996. Analysis of a fisheries model for harvest of hawksbill sea turtles (Eretmochelys imbricata). Conservation Biology 10(3): 874–880. Retrieved January 21, 2009. Karl, S. H., and B. W. Bowen. 1999. Evolutionary significant units versus geopolitical taxonomy: Molecular systematics of an endangered sea turtle (genus Chelonia). Conservation 13(5): 990–999. Retrieved January 19, 2009. Iverson, J. B. 2004. Cheloniidae. In B. Grzimek, D. G. Kleiman, V. Geist, and M. C. McDade. 2004. Grzimek's Animal Life Encyclopedia. Detroit: Thomson-Gale. ISBN 0307394913. Iverson, J. B. 2004. Dermochelyidae. In B. Grzimek, D. G. Kleiman, V. Geist, and M. C. McDade. 2004. Grzimek's Animal Life Encyclopedia. Detroit: Thomson-Gale. ISBN 0307394913. Kinan, I. 2006. Longline fishery panel discussion at the 26th Annual Sea Turtle Symposium: Cooperative approaches to implement sea turtle bycatch solutions in longline fisheries. Marine Turtle Newsletter 113: 13-14. Retrieved January 21, 2009. Lutz, P. L., and J. A. Musick. 1996. The Biology of Sea Turtles. CRC PRess. ISBN 0849384222. Retrieved January 21, 2009. MarineBio. n.d. Chelonia mydas (green sea turtle). MarineBio. Retrieved January 21, 2009. Marshall, A. T., and Cooper, P. D. 1988. Secretory capacity of the lachrymal salt gland of hatchling sea turtles, Chelonia mydas. J. Comp. Physiol. B 157: 821 -827. Nicolson, S. W., and P. L. Lutz. 1989. Salt gland function in the green sea turtle Chelonia mydas. J. Exp. Biol. 144: 171 -184. Reich, K., K. A. Bjorndal, and A. B. Bolten. 2007. The "lost years" of green turtles: Using stable isotopes to study cryptic lifestages. Biology Letters 3(6): 712-714. Retrieved January 19, 2009. Reina, R. D., and P. D. Cooper. 2000. Control of salt gland activity in the hatchling green sea turtle, Chelonia mydas. J. Comp. Physiol. B 170: 27-35. Reina, R. D., T. T. Jones, and J. R. Spotila. 2002. Salt and water regulation by the leatherback sea turtle Dermochelys coriacea. Journal of Experimental Biology 205: 1853-1860. Retrieved January 21, 2009. Sadove, S. n.d. The leatherback sea turtle: A marine mammal at sea. ARBEC Turtle Conservation. Retrieved January 19, 2009. Schafer, E. H. 1962. Eating turtles in Ancient China. Journal of the American Oriental Society 82(1): 73–74. Retrieved January 21, 2009. Settle, S. 1995. Status of nesting populations of sea turtles in Thailand and their conservation. Marine Turtle Newsletter 68: 8-13. Retrieved January 21, 2009. Smith, T. 2007. Turtles and birdlife at risk from long-line fishing, claim campaigners. The Royal Gazette. Retrieved January 21, 2009. Spotila, J. R. 2004. Sea Turtles: A Complete Guide to Their Biology, Behavior, and Conservation. Baltimore: Johns Hopkins University Press. ISBN 0801880076. Strieker, G. 2001. Tortoiseshell ban threatens Japanese tradition. CNN April 10, 2001. Retrieved January 19, 2009. United Nations Environment Programme - World Conservation Monitoring Centre (UNEP-WCMC). 2009. Eretmochelys imbricata. CITES species database. Retrieved January 21, 2009. Witherington, B. E. 2006. Sea Turtles: An Extraordinary Natural History of Some Uncommon Turtles. St. Paul: Voyageur Press. ISBN 0760326444. WWF. 2007. Marine turtles. World Wide Fund for Nature. Retrieved January 21, 2009. This page was last modified on 21 January 2009, at 20:47.